I am indulging myself in going slightly dog mad these days. Ever since our beloved English Springer Spaniel died last year at the age of 12 we have missed not only her but also the walks and the games. So it was pretty easy to decide, as a family, to have another dog. The whole family cannot wait for our puppy (A Welsh Springer this time) to arrive in about 5 weeks time. In the mean time we indulge in everything dog! 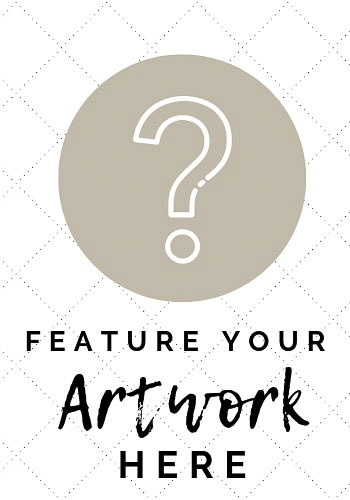 What better way to look forward to my new studio addition than to browse some historic dog art? Dogs feature in art history endlessly. There are hundreds of paintings which feature man’s best friend. Here are a few of my favourites (ordered chronologically). It is all slightly Spaniel biased, sorry…. Van Zelven (attr. 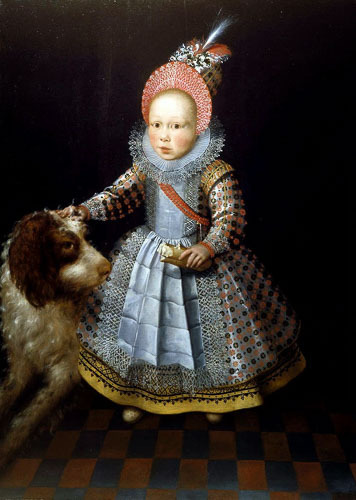 ), Portrait of a Child with a Dog, 1605. 105x76cm. An early Netherlandish portrait by a fairly unknown artist. Justus van Egmont (attr. 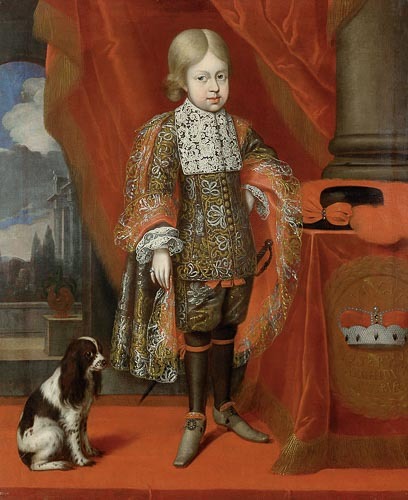 ), Charless II as Prince of Wales, 1630. 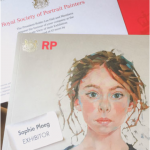 National Portrait Gallery, London. The earliest known portrait of Charles II. 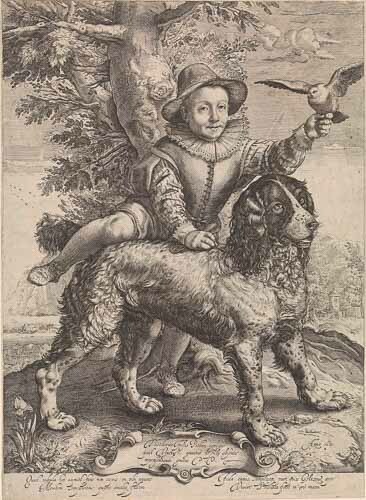 Portrait of Frederik de Vries with the dog of Hendrick Goltzius, Print, 1631. Anonymous print after work by Hendrick Goltzius. Rijksmuseum Amsterdam. 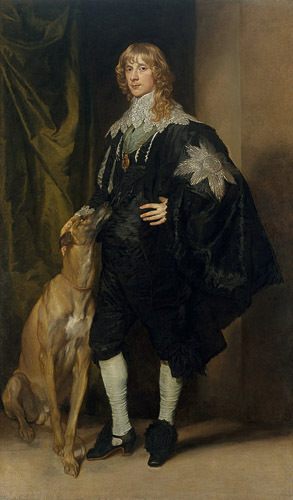 Anthony van Dyck (1599-1614), as a court and aristocracy artist, painted an awful lot of dogs. 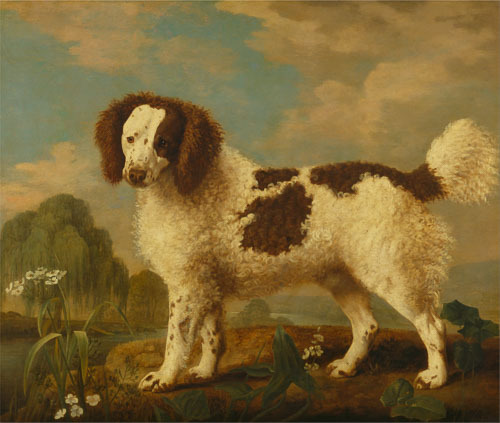 Many of his portraits include the family pooch and many of these were spaniels. Below are three of his portraits but there are many, many more. His depiction of these animals almost makes one think he loved dogs more than humans as they are painted with such care and attention, and lack the distant lofty air of supremacy of many of his sitters. His care in depicting the muscular structure in James Stuart’s greyhound is simply beautiful as is the head and loyal adoring look in the dog’s eyes. 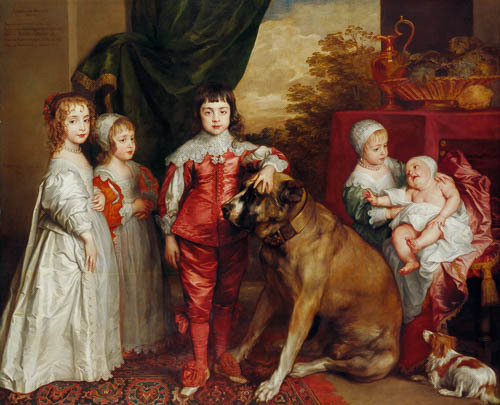 The huge centrally-staged dane in the portrait of the royal children is impressive, not because of the size of the dog, but the way Van Dyck painted it in all its meaty massiveness. 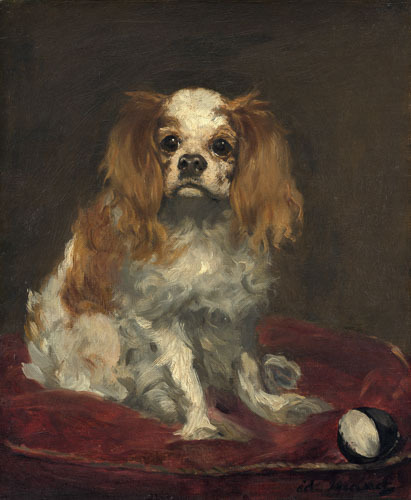 Lastly, the cute little spaniel in the portrait of the Wharton girls is showing such typical spaniel behaviour: he wants a play, a bit of attention as these creatures never tire and are always up for a game or two! Anthony van Dyck, Portrait of James Stuart (1612-1655), Duke of Richmond and Lenox, 1637. Metropolitan Museum of Fine Art, Washington. An interesting talk about greyhounds in art can be found on the Met Museum’s website. Anthony van Dyck. Five Eldest Children of Charles I, 1637. Royal Collection. Anthony van Dyck, Portrait of Elizabeth and Philadelphia Wharton with their dog, 1640. 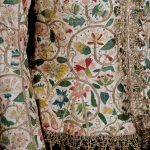 Walpole Collection, Houghton Hall. The painting below by Gerrit Dou is one of my favourite dog pictures. It is only 16.5 x 21.5 cm and spectacularly detailed and refined in its execution. 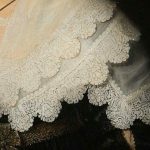 The painting had not been seen in public for a long time, until the owner died in 1999. 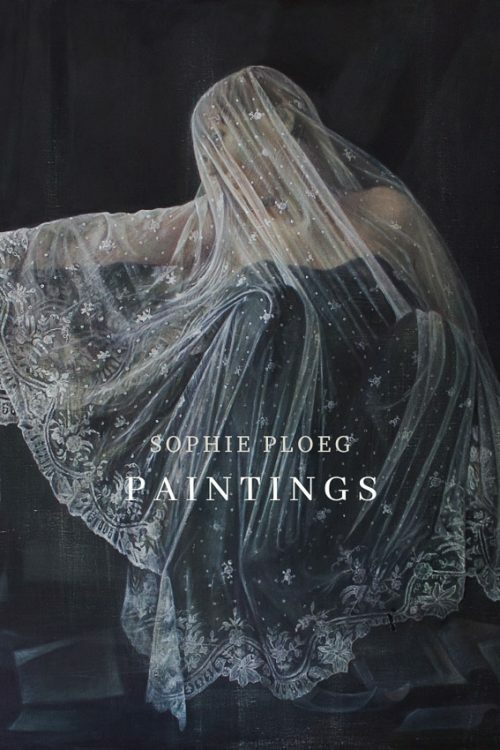 It was then sold in 2005 and is now in the Eijk and Rose-Marie van Otterloo’s private collection. Thankfully they are happy to lend it out once in while so we can all enjoy and admire it. Recently the work was on show in Dou’s hometown of Leiden in a major exhibition around Gerrit Dou. Gerrit Dou, Sleeping Dog, 1650, 16x21cm. Private Collection. Ludolf de Jongh, Portrait of a young boy, 1661. Virginia Museum of Fine Arts, Richmond. 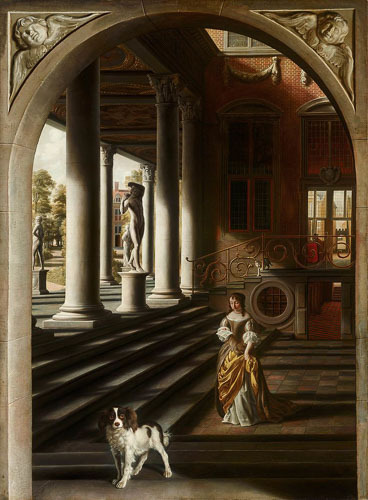 The huge work below is by Samuel van Hoogstraten, a painter and writer who enjoyed creating architectural trompe l’oeil paintings of interiors. 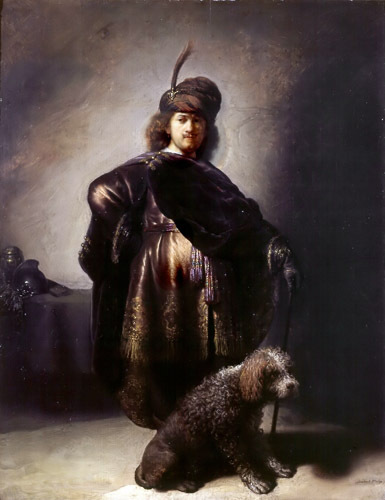 This, and a similar work in Dyrham House near Bath (see here for my blog post about this), is very large at 214cm tall, and both feature a dog (often used as symbol of marital fidelity and loyalty in Dutch 17th century paintings). The National Gallery in London has a ‘peepshow’ on display; a wooden box with painted interior scenes where the artist made a clever use of perspective to enhance the sense of reality. 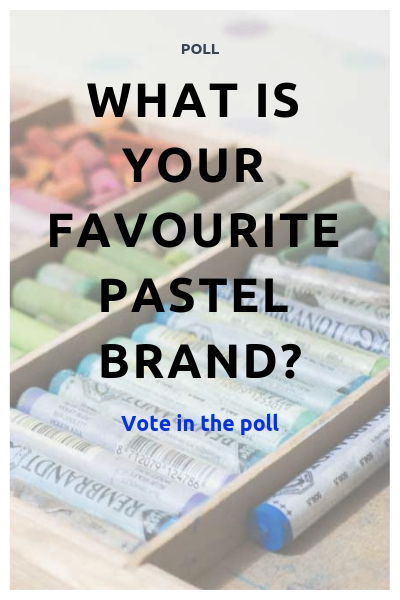 For more info, look here, on the National Gallery’s website. This portrait below I find a bit odd. The boy is painted a tad clumsily and schematised. But I found myself looking at it again and again. In all its clumsiness it is very charming and I think it quite appeals to our modern mind to look at a child, painted rather naively. The lovely springer spaniel, with its very long ears is looking knowingly at us…. Benjamin Block, Emperor Joseph I. 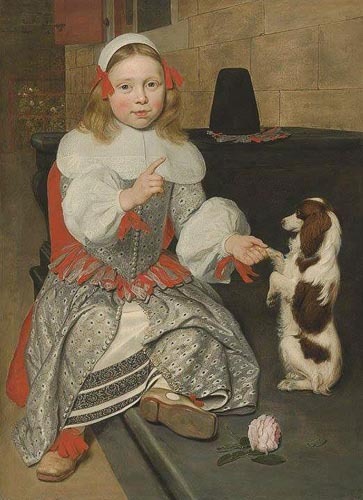 (1678-1711), 6 years of age, with his dog. 1684. Kunsthistorisch Museum Berlin. I’ve collected some more dog art on my Pinterest board – click here to have a nose. Thank you for such an interesting post. 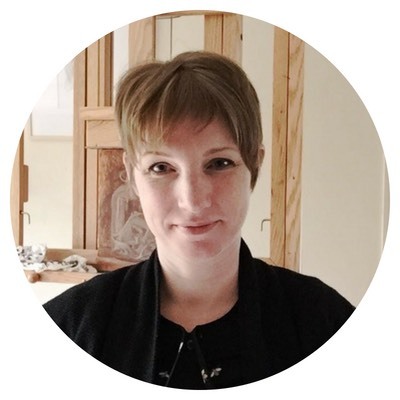 Your blog is very helpful to me, a recent atelier grad, as I try to develop skills and find a voice. Thanks for your generous mentoring to all of us, via the internet! Thank you Patricia, so glad you are enjoying my blog!